A new play by Julia Izumi, directed by Ann Noling. 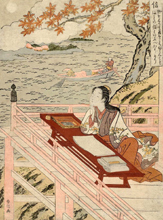 Lady Murasaki Shikibu (c. 973-c. 1014) is appearing in conversation to re-launch The Tale of Genji, one of the world’s first novels. The event is more than a millennium late, but Lady Murasaki makes up for lost time with trenchant and hilarious comments on contemporary culture. In the process, she confronts the lasting power of her art form and questions how her gender and nationality have affected her work and legacy. Lady Murasaki wrote a novel centuries before Cervantes or Fielding, yet she is rarely discussed outside the walls of academia. Meet Murasaki Shikibu breathes new life into this famous yet little-known epic of medieval Japan and its author. This play, performed here as a staged reading, was developed with the support of The Brewing Dept. Julia Izumi is a playwright and performer. Her plays have been produced and developed at the New Ohio Theater, Dixon Place, the Martin E. Segal Center, Chicago Dramatists, Primary Stages, and Tufts University. She is a proud member of the BMI Librettist Workshop and the Artistic Committee of The Brewing Dept. She was the recipient of HB Studio’s 2015 First Floor Residency alongside director Logan Reed. Recent performance credits include HamletGhosts (HERE), Spring Awakening (Lust & Liberty) and Dracula, Or the Un-Dead (Williamstown Theatre Festival). She has also worked with Signature Theatre Company, the New York Neo-Futurists, and the Under the Radar Festival at the Public Theater. Ann Noling has developed new plays with Rat King Theatre, The Habitat Theater Company, and The Brewing Dept., and her work has been seen at Dixon Place and the Fourth Street Theatre. She has assisted for David Auburn, Robert O’Hara, Davis McCallum, and Ken Rus Schmoll and was a 2014-15 Robert Moss Directing Fellow at Playwrights Horizons. This event is generously underwritten by Alexander Sanger in honor of Jeanette Watson Sanger.